There is now a sph-sgminer fork with Luffa512 algorithm support available thanks to djm34 (source), the guy that just released ccMiner fork with Luffa512 support. We have compiled a windows binary from the latest source and have already tested it mining DoomCoin on an AMD Radeon R9 280X GPU to see what performance we are going to get – the result was about 143 MHS (faster than current performance on Nvidia GPUs). You can download and try the windows binary yourself from the link below. Do note that this version of sph-sgminer also supports most other new algorithms as well, so you an use it for mining not only DoomCoin. Also make sure to be using the latest 14.6/14.7 beta drivers from AMD in order to get the best performance and currently it seems that Nvidia GPU miners have some advantage in terms of performance for this algorithm. 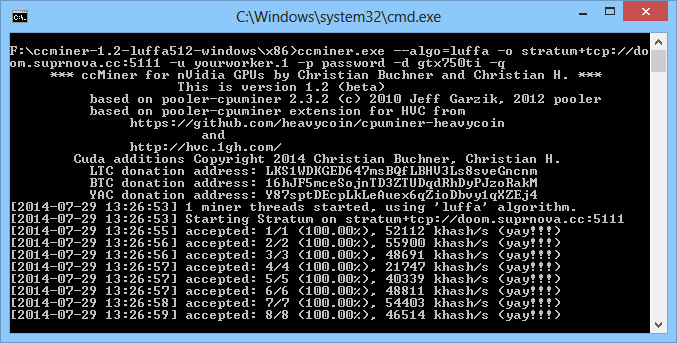 The ccMiner fork from djm34 (source) received another update that adds support for the Luffa512 algorithm used by crypto coins such as DoomCoin. A new coin that was recently announced as a CPU-only crypto, but is now also mineable by Nvidia GPUs and while there is still no GPU miner AMD rigs available, but one will most likely follow very soon as well. 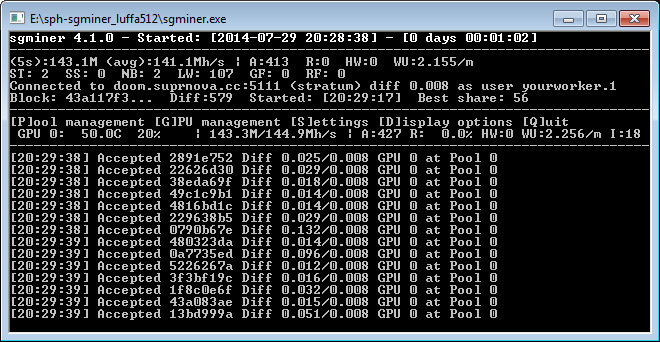 We have compiled a Windows binary from the latest source and have tried it out mining DoomCoin, on GeForce GTX 750 Ti we are getting a hashrate of about 55 MHS and on GeForce GTX 780 Ti the hashrate is about 90 MHS. You can download an try the windows binary of the miner from the link below, do note that this version of djm32’s ccMiner fork supports all of the previously released algorithms as well. The windows binary available here is compiled for Compute 3.0, 3.5 and newer cards (32-bit version only) in a single binary, so it will not work on older cards. If you are unsure what version of Compute does your video card support check the included GPU Compute Capabilities List file. The binary is compiled with Visual Studio 2010 and is backwards compatible with Windows XP as well if you are using it on your mining rig. Update: You might want to redownload the updated version of the miner from the link below as it brings significant performance improvement, the new hashrate you can get is about 80 MHs on GTX 750 Ti up from about 55 MHS and on GTX 780 Ti the performance is now about 120 MHS up from about 90 MHS.